Summer in the high country of Colorado means gorgeous alpine views, snowmelt and with that, carpets of wildflowers. Wildflower season usually peaks near the end of July in the Colorado high country. Join us on a photographic adventure into the heart of alpine country! We will be based in the San Juan Mountains. 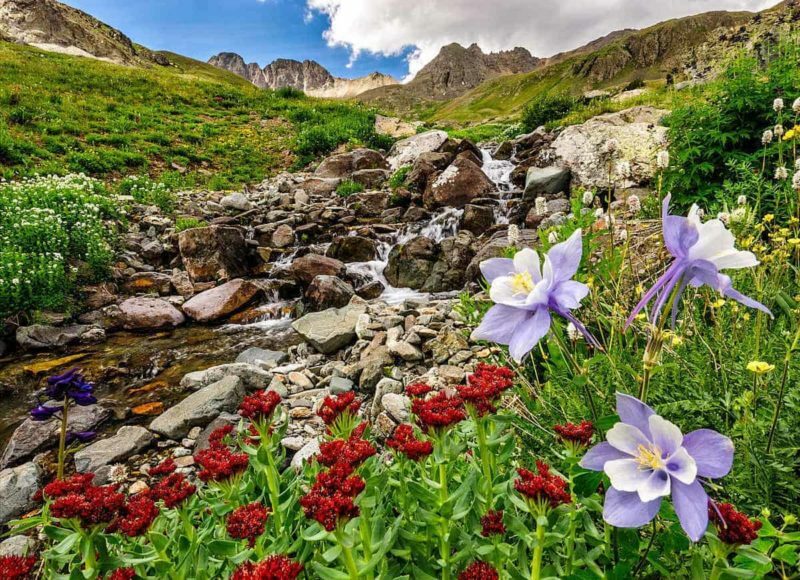 Set among the peaks and old mining camps, the flower displays combined with blue alpine lakes are a photographer’s dream. We will spend four days adventuring in Jeeps to the wildflowers that are only accessible by 4×4. Waterfalls, fields of paintbrush flowers, and crystal clear alpine lakes left behind by the glaciers are just a few examples of what we will be photographing. This area is near and dear to our photographic hearts, and we have spent extensive time exploring, scouting, and photographing this area. If you’re looking for a summer photography adventure, join us in the high country of colorful Colorado! This workshop is not strenuous, we will only hike short distances. We will be at extremely high elevations above 12,000 feet. Not recommended if you get altitude sickness easily or if you are scared of heights as many of the roads we are driving have steep drop offs and not for the faint of heart. Yes! Many of the locations selected require a high clearance 4×4 to reach. All of the participants will ride in our 4×4 vehicles. You will all get to share the experience together without worrying about the logistics. You only need to get to the hotel via taxi, shuttle, or rental car, the rest is taken care of. You are welcome to drive your own vehicle if you prefer. Lenses – Extreme wide angle is recommended (16-35 range on full frame or 10-20 range on a cropped sensor), a mid range zoom, and a telephoto of at least 200mm. If the workshop includes night photography you will want to take a look at our list of recommended gear for night photography. Tripod – A sturdy tripod is necessary, David uses Feisol tripods, but also recommends Really Right Stuff, Induro, and Gitzo.